Learning Hub 8 @ Stonefields School: Isaac's Book Report - The Republic Of Thieves. Setting: Medieval, poverty, rich, alchemy,magic, thieves. Locke, a largely known and sought for thieve, his hair a brownish-blonde colour with a grin plastered all over his face, slight scars travelling down his back and arms. Usually wears a refined black coat with a rapier and dagger hanging at his sides. Locke is jolly most of the times, frequently hiding his craftiness and the grim side of him under a facade of happiness. 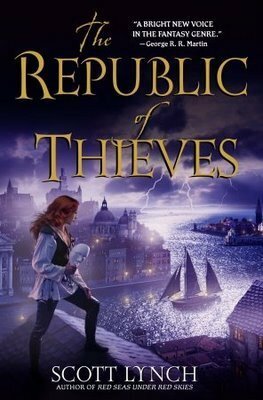 The year is 1256, a group of lethal mercenaries have been let loose on the known world, paid to hunt and kill the leaders of a widespread black market company feared on every continent known as The Republic Of Thieves. When Locke and Jean find themselves as the only obstacle between their source of income and the deadly group of paid killers, they are thrown into a incredible world of deceit, espionage and secrets. Will Locke and Jean make it out alive? Or will they never come back? I would definitely recommend this book as a MUST read. Every page is filled with delicious descriptions and events, with new aspects at every step. The plot is genius, slowly stretching over a long span of time whilst still retaining its juicy details throughout the book and beyond into other sequels. The way the main characters and other sub-characters are weaved into the plot are amazing, every event understood with clarity one after the next. This book and its series is truly one of a kind.